Columbus is home to many unique neighborhoods full of character, entertainment and dining. 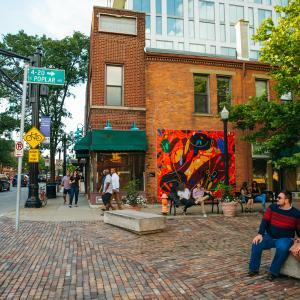 A prime example is the Short North Arts District located just steps away from the Greater Columbus Convention Center and Columbus’ downtown core. Home to art galleries, boutiques, restaurants and nightlife there is no shortage of activities to fill 36 hours. Let us help you plan! Let’s start with hotel ideas. Try Le Meridien Columbus, The Joseph, a boutique property in the heart of the Short North Arts District. The Joseph is home to a collection of art from the Pizzuti Collection and The Guild House, a restaurant open for breakfast, lunch and dinner from local restaurateur Cameron Mitchell. Looking to go the B&B route? You’re in luck with a number of options in the area including, 50 Lincoln-Short North Bed & Breakfast, Harrison House Bed & Breakfast and Victorian Village Guesthouse. After you’re checked-in, take a stroll down High Street to Mouton, where you can grab a vintage cocktail. Looking to go the wine route? Visit Tastings-A Wine Experience. They boast “one of the largest selections in the world for wines-by-the-taste.” Perfect if you or your friends are indecisive in your wine preference. Wine on High is a great retail wine shop where you can also taste while you peruse their selection of wines. One of the greatest draws to the Short North Arts District for visitors and locals alike is the dining scene. 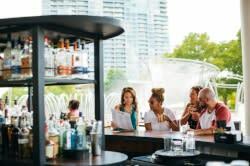 Whether you visit one of the many Cameron Mitchell restaurants in the neighborhood like Marcella’s and The Pearl or visit Rossi Kitchen & Bar, you cannot go wrong. We could write an entire blog series on dinner alone in the Short North Arts District. The possibilities are endless! Visit one of the stops on the Columbus Coffee Trail like One Line Coffee or Roaming Goat Coffee to get your morning coffee fix. One of my favorite things to do in the Short North Arts District is to just stroll up and down High Street. This way you will not miss a boutique, art gallery or shop. If you’re in to fashion, be sure to visit Rowe Boutique, Fount, Tigertree and Homage. Stop at Brassica to build a veggie-centered Mediterranean picnic lunch to enjoy in Goodale Park. Try the new Short North Food Hall for dinner tonight. Five kitchens await you and your friends, so everyone will find something they love. After dinner grab a drink next door at Standard Hall or hone your skee-ball skills at Brewcadia. Start your day off on the right foot with breakfast at Native Cold Pressed, Philco Bar + Diner or Forno. Walk off breakfast by taking a stroll through Goodale Park. Be sure to visit the elephant fountain which pays homage to the circus that was once held there. Before you head out of the city, be sure to visit the North Market, Columbus’ public market since 1876. Here you will find merchants and farmers with everything from ice cream to tacos to spices and produce. The North Market is a great place to purchase a taste of Columbus to take home with you! We hope this guide services as a starting point as you plan your trip to the Short North Arts District! The best way to truly explore the district is to just get out and walk! Enjoy!